The experienced fullback is determined, but realistic about his European goals this season. 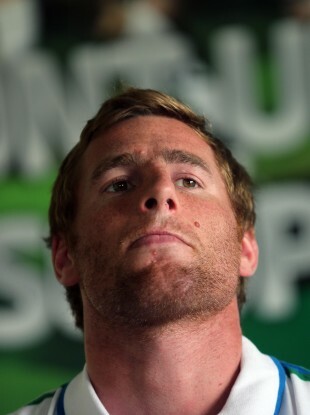 In his second year as captain of Connacht, Gavin Duffy has mulled over this subject before. The tiresome answer he suggested would have been accepted. He is a competitor. But nobody, perhaps not even those in the heart of the Connacht dressing room, are ready to believe they can go and win every game in a Heineken Cup pool. Leave that for the multi-million euro budget of Toulouse or the dynasties created in Munster and Leinster. Connacht are a different breed. The last 12 days have shown two extremes of what Connacht are capable of. At home to the reigning European Champions they rained down fire and embarrassed a young Leinster side out the gate with their raw intensity inflected with coherent back-play. Seven days later, they travelled to face the Heineken Cup runners-up without showing a trace of that fight. Of course, plenty of water had passed under the bridge, Eric Elwood had publicised his decision to leave and they moved a week closer to their second tilt at the Heineken Cup. Duffy, 31, agrees that the western province will take up a rare mantle as favourites, having already taken a wining bonus point off Zebre this season. “We were very lucky to come away with a win over there.” Says Duffy. “We played good rugby in the first half, yet we still couldn’t shake them off. They will have come together a hell of a lot more in the past couple of weeks and they nearly beat Glasgow away as well. As a group, they vow to embrace the hard lessons learned in five defeats last year. However, one in particular stands out for the captain. Matchday two, when the big cup’s biggest team landed in the west. Biarritz will bring another world superstar to the Sportsground in the formidable shape of Imanol Harinordoquy, but the Basque side are not the powerhouse they once were. If they have not listened intently to Guy Noves’ warnings, the element of surprise may very well play to Connacht’s advantage. However, there is no chance of that in the case of the English champions, Harlequins. Between previous encounters in Europe and Duffy’s three-year 110-game tenure at the Stoop, was there really a need for the sides to play again in pre-season? With Conor O’Shea at the helm, you suspect Quins will be successfully fore-armed this time around. “It’s a tough one.” The fullback says of the question posed upon himself above. The answer he delivers is refreshingly honest and devoid of rhetoric. He says the away performances are improving. But at home to Leinster a bar was set. A bar they will demand be hit every time they take the field. Losers? They quit. Two pool games in they send a shadow side to gain experience, to save face. They let Harlequins roll them over and progress to a European quarter final. Connacht, on the other hand, refuse to rest until they are respected. Email “Heineken Cup: Duffy ready to answer Connacht’s tough questions”. Feedback on “Heineken Cup: Duffy ready to answer Connacht’s tough questions”.